Adiponectin is a protein made by fat cells that circulates in the bloodstream, acting as a messenger. It plays a role in how the body uses sugar, or glucose, and fat for energy. Low levels of adiponectin may be seen in people with obesity and in those with insulin resistance -- a decreased response to the hormone insulin, which enables the body to use excess glucose in the blood. Insulin resistance is part of type 2 diabetes, a condition characterized by abnormally high blood glucose levels. Higher adiponectin levels have been associated with improved sensitivity to insulin and lower blood glucose levels. Thus, for people with type 2 diabetes, a diet that raises adiponectin levels may be beneficial. A number of studies have been conducted to investigate how diets affect adiponectin levels in the blood. A study reported in the March 2007 "Diabetes Care" found that in people with insulin resistance, the level of adiponectin gene expression was lower after a carbohydrate-rich meal versus after meals rich in monounsaturated fats (olive oil) and saturated fats (butter). However, it is difficult to know exactly how to interpret this since the blood levels of adiponectin weren't significantly different among the three meal types. Another study performed on men with diabetes published in the May 2005 "Diabetes Care" found a positive association between increased fiber intake in the form of cereal and increased adiponectin levels. Magnesium, which may be found in whole grains, was also associated with higher adiponectin levels. Thus, consuming a diet rich in fiber and magnesium might increase adiponectin levels. The Mediterranean diet has many health benefits. It consists of consuming mostly plant-based foods, white meat and very little to no red meat. It is high in vegetables, fruits, legumes, whole grains, nuts and healthy fats, such as those found in olive oil and fish oil, with very little saturated fats (like butter) and sugars. A study in the August 2006 "American Journal of Clinical Nutrition" found that women with diabetes who followed a Mediterranean diet for 1 year had 23 percent higher adiponectin levels when compared with those who did not. A review of studies published in the November to December 2010 "Nutricion Hospitalaria" showed that in animals an increased consumption of saturated fats -- the "bad fats" found in cheese, red meats and butter -- decreases the levels of adiponectin in the body. Thus people with diabetes may benefit from avoiding diets high in saturated fats, since decreased adiponectin is associated with less sensitivity to insulin and higher blood sugar levels. There are "good fats," however, that may increase adiponectin, such as monounsaturated and polyunsaturated fats, found in olive oil, nuts and avocados. 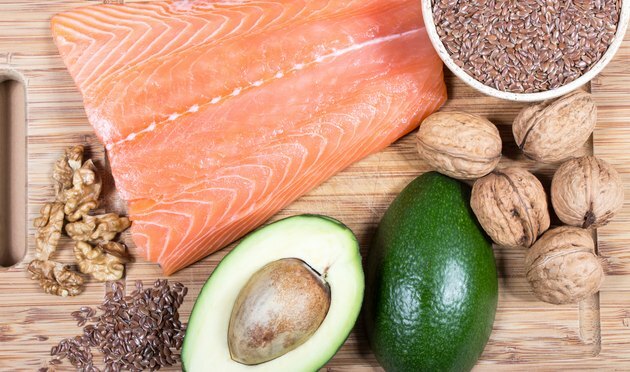 The review found that animals that had diets rich in polyunsaturated fats, such as the omega-3 fatty acids found in fish oil, had an increased level of adiponectin in their bodies. Adiponectin helps stimulate the breakdown of fat molecules so the body can use them for energy. It also signals the liver to stop making or releasing glucose when blood glucose levels get too high. Both of these roles are thought to explain how adiponectin can increase the body's sensitivity to insulin, the hormone that helps people use blood glucose for energy, and thus improve diabetes. According to the August 2004 "Obesity Reviews," direct administration of adiponectin to animals increased insulin sensitivity and lowered blood glucose levels. Thus, increased adiponectin levels in the blood may benefit people with diabetes. Because obesity is associated with both type 2 diabetes and low adiponectin levels, weight loss is an important intervention. Diets that may increase adiponectin levels could also be helpful, but they should be undertaken with the guidance of a healthcare provider and a registered dietititian. In the future, drugs may become available that work directly on adiponectin.